With Alessia Aureli and Andrea Vaturi, Italy has a strong future in ice dancing. Aureli began skating when she was six and started competing in dance at eight. “My parents brought me to public skating, then I started taking lessons. There was no real reason I began dancing, but I love expressing feelings with music,” she said. 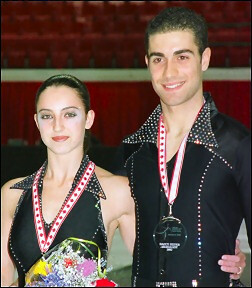 Aureli has had several previous partners, while Vaturi competed for ten years with Lidia Lewandoski, reaching the Junior Worlds in 2001 when they finished 21st. When their respective partnerships ended two years ago, Vaturi moved from Rome to Milan to continue working with coach Walter Rizzo. Since he knew Alessia, he asked her to skate with him and their partnership began. They use several choreographers, including Natalia Bestemianova, Andrei Bukin, Barbara Fusar Poli, and S. Atti. “Our coaches proposed our original dance music, a waltz and a polka,” he explained, “but we chose our free dance music. We found it just by chance at a party. It’s from the Footloose soundtrack. The slow part is Almost Paradise and the other part is Footloose.” “We like to skate to something like jive or Latin American like the rhumba and the cha cha,” she noted, “not to classical music. Some of our best dances are tangos and sambas. The original dance is very hard for us and we always seem to skate a waltz in compulsories. The waltz is always our worst dance.” Off ice, he listens to music on the radio and folk music, while she prefers Italian music. She likes Madonna and Whitney Houston, while he prefers Brian Adams and George Michael. He is in his second year at the University of Milan, studying economics. “It’s the most practical kind of studying in Italy,” he said. “I had a classical high school education and I wanted to study philosophy or Greek history, but there are no jobs for philosophers.” After he finishes skating, he plans to coach for a short time to make some money, but said, “it’s not the job of my lifetime.” Aureli is in her last year of study at a high school where she is specializing in marketing for tourism. “I like travel and languages and there are a lot of jobs in that area,” she said. Other than Italian, she understands English, Spanish and some French, while Vaturi knows English, and some Hebrew and Arabic in addition to Italian. Off ice, Vaturi likes to go to the disco. He studies a lot and is practicing playing the piano again after a break of several years. Aureli said she likes “what every boy and girl like to do, going out with friends and shopping. She likes watching action, comedy and romantic movies, while he enjoys action films and movies like “Grease” and “Dirty Dancing” and Steven Spielberg films. Neither of the skaters collects anything special. They both have computers for school and email. “I use the computer a lot,” he said. “We have compulsory classes and have to present projects on the computer. I also go on the Internet a lot and email friends around the world.” Aureli mainly uses her computer for email. Aureli likes to “go to the sea near Rome” on holidays, while Vaturi’s favorite vacations are in Sicily, where his grandmother has a farm. He also enjoyed seeing Israel and the Dead Sea. Vaturi cited New York as one of her favorite trips. “It’s very different from the Italian cities with the big buildings and the skyscrapers,” she said. “In Italy, everything is tiny. I loved the shopping.” She would like to visit Egypt and Australia, while he wants to see China and Japan.